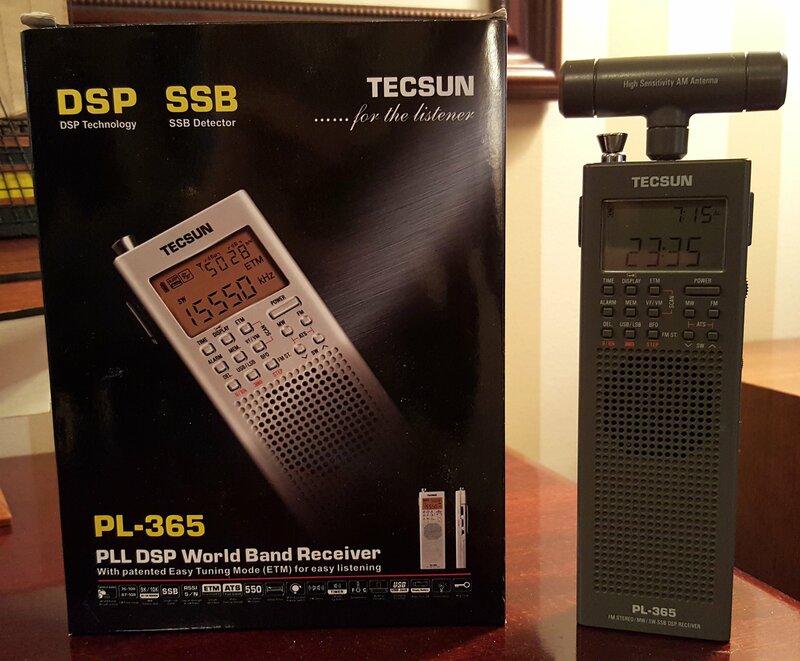 The Tecsun PL-365/CountyComm GP-5/SSB looks almost identical to the earlier PL-360/GP-5-DSP but has been redesigned internally and is in fact built around a new chip, the SiLabs Si 4735 (the earlier models used the Si 4734). The new model adds SSB which was a prime requirement on the part of CountyComm who commissioned Tecsun to re-design the radio to meet the needs of government agencies for a small, inexpensive but good quality HF Communications receiver. There have been other enhancements added as well, including SW coverage all the way up to 30 MHz and extended battery life, which is claimed to be 225 hours on a set of three Alkaline AA cells. 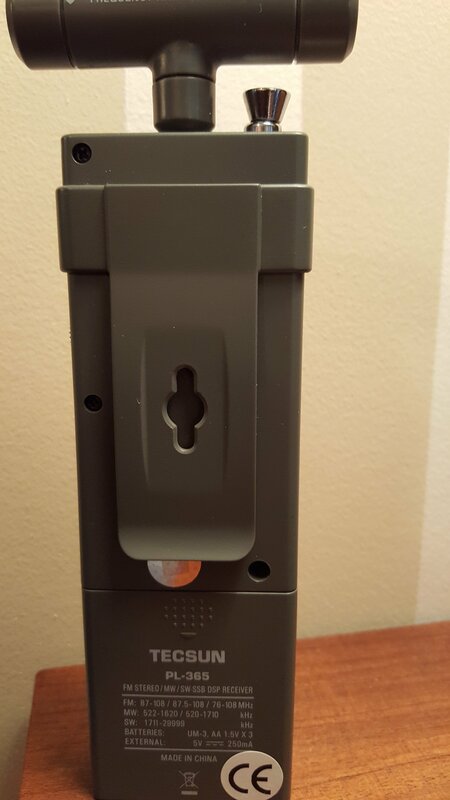 The radio will also internally recharge rechargeable batteries from any USB connection although no batteries are supplied with either the Tecsun or CountyComm’s version. The only apparent differences between the CountyComm versus Tecsun branded versions appear to be cosmetic ones…the color of the antenna tip and Tuning thumbwheel. The PL-365/GP-5/SSB is designed for easy one-handed operation in the style of a walkie-talkie. It comes with a unique plug-in rotating ferrite rod antenna for AM and LW, a wire antenna for SW, a belt clip, padded carry pouch with belt loop, ear buds and Owner’s Manual. 450 memories – 100 AM, 100 FM, 250 SW Plus 100 ETM memories for temporary scanning storage such as when travelling…very handy indeed. Tuning is via a thumbwheel with Up/Down Band Selection buttons and ETM Tuning and there is an analog volume thumbwheel on the right side as well. LCD Display of Frequency, FM Stereo, Battery level, Charging indicator, Signal Strength, Signal to Noise ratio, Temperature, Alarm, Sleep Timer, SW Band, Memory Address, ETM, Key-Lock etc. CountyComm of Sunnyvale, CA designs and supplies specialized products for local, state and federal agencies. They work directly with Silicon Labs (DSP chip manufacturer) and Tecsun and are the sole US importer of these models…even Kaito USA which is the US Importer of Tecsun radios shows only the older PL-360 on their site. It is possible that once CountyComm’s order has been fulfilled, Tecsun or Kaito versions may begin to appear at Kaito US and the Tecsun version at the usual eBay sites but so far only the older non-SSB model is thus available. My review sample was provided to me by the great folks at Tecsun Australia who tell me they will gladly ship anywhere in the world. (See link at end of review). In Use: The PL-365 is quite different than the traditional portables we have become accustomed to. The entire concept of one-handed operation makes for a completely different user experience. Again, think “Walkie-Talkie”without the “Talkie” and you’ll get it. The PL-365 conjures images of special ops forces trying to ferrite a criminal from his hiding place. Once you are comfortable with this kind of operation the radio begins to feel natural…and kind of cool! Initially I found the radio a bit awkward to get from here to there quickly in the SW bands since there is no keypad for direct frequency input. Even with the Up/Down band buttons which divide SW into 14 bands (and a separate group of 12 Ham Bands in SSB mode) , you can do lots of thumb-wheeling to get from one end of a band to the other. But after using it for a while I discovered ways to make frequency hopping easier and more intuitive. The most obvious is to use frequency presets at strategic frequencies, from which you can then tune up or down easily to get to your desired frequency. Also the ETM (Easy Tuning Mode) function on this radio is helpful because it does not disturb your regular presets…the ETM has its own, temporary 100 station memory which is perfect for travelling to new areas where you can quickly populate that memory bank with receivable signals in that location leaving all your other 450 presets untouched…very convenient. The tiny speaker offers minimal audio quality…this radio is clearly designed for voice communications and with the included earbuds you can have both privacy and better quality audio when needed..even FM Stereo. Rotating AM Ferrite Rod Antenna: OK. I’ll admit that at first I thought it strange to incorporate a rotating ferrite rod AM antenna on a radio this small..after all, why not just turn the whole radio? But after seeing how small the radio is and actually using it I realized that its main purposes are to allow a larger ferrite rod than that which would fit inside the radio, plus the ability to remove it completely to make the radio even smaller when it isn’t needed – you can still pick up strong local AM signals without it. When it is installed you can rotate it out of the way to extend the whip antenna. Performance: Here’s where the rubber meets the road. Because it is central to the design objective for this radio I concentrated on SW performance first. I compared the PL-365 with several popular portables and it was competitive, fairing slightly better than the many under $60 radios and slightly less well than radios in the general $125 – $200 price range. SW sensitivity was a hair less than the larger Tecsun Portables such as the PL-660-, PL-680 and PL-880. The PL-365 performed at its best as long as I was holding the radio in my hand…some signals were weaker when I set the radio down so evidently hand capacitance is important here…not unusual with smaller portables. As expected sensitivity was much better using the supplied clip-on wire antenna. The ETM function was very helpful finding listenable SW signals. Selectivity was good…I had no trouble separating most SW signals from nearby ones on the dial. Interestingly the PL-365 has two filter bandwidth options…a wide filter (I would guess it to be about 6 KHz) and a narrow filter (I’d guess perhaps 2.5-3 KHz) which is automatically switched in when you enter SSB mode. While purists might argue that it would be nicer to have manual control over the two bandwidths in both modes, the other side of the coin is that this is an elegant way to simplify one-handed operation. SSB Mode was an important part of the PL-365’s design and considering the one-handed design of the radio Tecsun has done an incredible job of making SSB tuning as precise and easy as can be – it actually works quite well once you get used to it. From SW mode press the USB/LSB button and after a few seconds you will see a “U” indicating that you are in Upper Sideband mode, or USB. Press it again to toggle to Lower Sideband mode and an “L” will display. Now the Up/Down buttons will scan the amateur (Ham) bands. Once you are tuned to a signal hit the BFO Button and fine tune with the tuning thumbwheel for most natural audio. Another press of the USB button exits SSB mode. In SSB mode the bandwidth is narrowed as I mentioned above and a new set of 12 meter bands are selectable. The SSB Fine Tuning increments of 50, 20 or 10 Hz are selected while the radio is off but generally you will find one setting which you prefer and leave it there. The default 50 Hz setting is fine enough to achieve decent results…of course as you decrease the increments to 20 or 10 Hz you gain finer control at the expense of a bit more thumbwheel turning. I ended up setting mine to 20 Hz – which setting you choose will depend largely on how you use the radio. Overall I found the PL-365 to be relatively easy to tune for natural sound on SSB. Some other radios with variable RF Gain might provide cleaner SSB audio recovery in some cases…a work-around with stronger signals is to try lowering the whip a bit. Again this radio was designed for small size, reliable SSB communications in the field so some compromises are inevitable compared with less-portable radios. AM Reception was better than I had expected. Although Tecsun’s current radios are somewhat noisy on AM, the PL-365 actually outperformed the larger PL-680 on AM with slightly better sensitivity and less background hiss on weaker signals. It was only a hair less sensitive than the PL-660 and PL-880 on AM which for this size radio is great performance. You can still receive strong AM signals with the ferrite bar removed but you’ll want to keep it handy for any real AM reception. 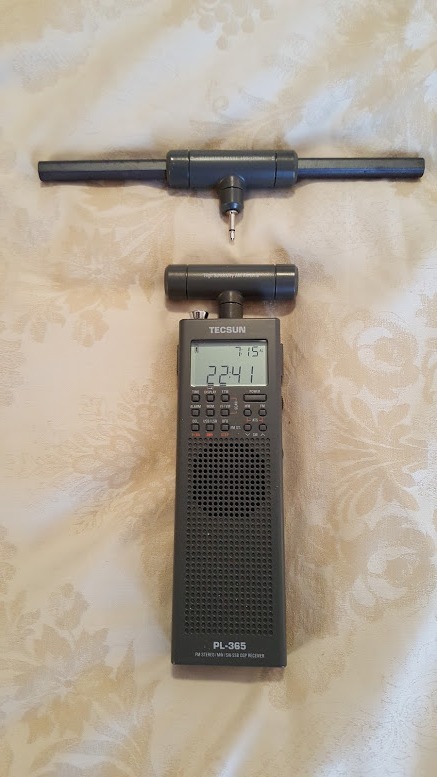 There is an after-market accessory 8” ferrite rod available for about $40 plus shipping that significantly improves the radio’s AM performance. (See picture) The seller has an online video which shows dramatic improvement on two frequencies. I obtained one of these antennas and it does significantly boost the AM reception capability as you would expect, raising the PL-365 from *1/2 Stars to ** Stars in my AM Mega Shootout ratings. Interestingly though the improvement is not consistent across the band…it varies from frequency to frequency. As per my usual methodology when rating radios I scanned the entire AM band at midday and tabulated the performance of the original ferrite against the longer ferrite on over 30 frequencies between 540 – 1700 KHz. The results were interesting. On many frequencies the signal level indicator on the radio showed markedly higher readings and improved S/N ratio along with greatly improved audio recovery. But on other frequencies the readings were actually poorer with the longer rod and the reception was audibly less strong. Even more interesting, on other frequencies the signal readings did not correlate with what I was hearing, with poorer numerical readings but improved audible reception, or vice versa. First, the longer ferrite rod does indeed provide improved reception on many stations, but there were some that were actually better with the shorter ferrite rod. Second, the radio’s signal level and s/n meter readings didn’t always correlate with what I was hearing. Usually they did but not consistently. I suspect this is simply the fact that these meter readings are not terribly accurate under all conditions, but it is possible that something in how the longer ferrite matches the radio’s input is at play. But it doesn’t really matter…the longer antenna does provide improved reception on many if not most signals and is a worthwhile investment if you plan to use your PL-365 on AM. FM Reception was very good overall. Comparing it with other portables the PL-365 made a good showing with excellent FM selectivity and capture ratio along with good to very good sensitivity. It also provides Stereo (switchable to mono) at the earphone jack. I wouldn’t rate it as the very best audio quality as it was somewhat bandwidth limited and there are no tone controls but for general listening it is fine. 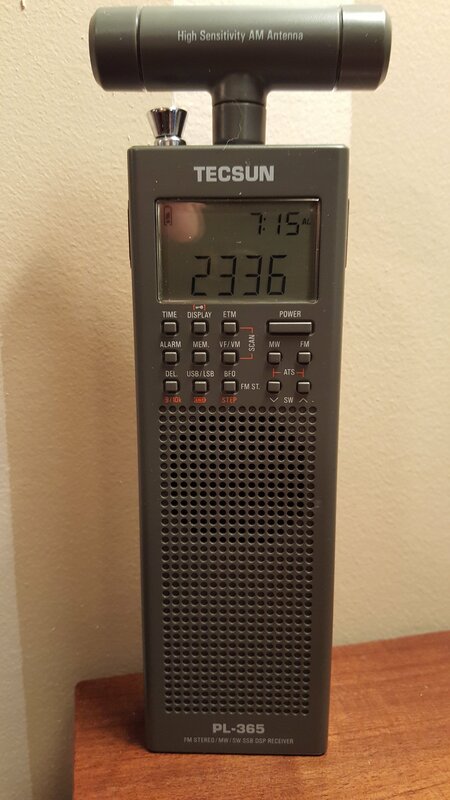 Other Characteristics: The PL-365 has the same Fast/Slow tuning feature found on many of Tecsun’s other radios which changes tuning steps based on how fast you tune. You have to learn the feel of it or it can be a bit unpredictable. Using AM as an example, as you begin to tune it will be start in Slow mode, progressing from, for example, 770 to 771, 772, 773. Once you reach 780 if you continuously tune it will switch to Fast mode (10 KHz steps) and progress to 790, 800, 810 etc. But if you hesitate for a moment it will revert back to 1KHz steps then switch back to Fast mode if you keep tuning. It can actually be very handy once you get the feel of it…it is not defeatable on the PL-365. The radio also mutes briefly while tuning which makes band scanning less enjoyable than it is on radios that don’t mute…common with many DSP radios these days and something the manufacturers will hopefully soon learn to eliminate. It does release very quickly on the PL-365 however which is a help so if you tune slowly enough you can hear what you’re passing over. (Many early digital radios made noises [known as “chuffing”] or muted themselves while tuning. Later designs eliminated this and gave us digital radios that tune as smoothly and seamlessly as old analog radios used to. Now the newest crop of DSP designs have given us great improvements in manufacturing cost, features, performance and unit-to-unit consistency but they also can take time to produce audio when you change frequencies…I’m hopeful it will eventually be eliminated completely). Conclusion: The Tecsun PL-365 is a bit difficult to compare with other multi-band portables because its “one-handed” form factor is so unusual. Certain design decisions were clearly made to enhance ease of use, yet it’s overall performance is excellent for the size and price. Most smaller radios are held while being tuned or carried around but they are generally operated with both hands, or placed on a desk or table. The PL-365 definitively changes all this with a tactical design which almost expects to be held full time as you would a walkie talkie. Once you accept that it becomes apparent that its layout and design were carefully considered and well executed. For example, the lack of a keypad is definitely a hindrance to ease of tuning, yet the general shape and layout of the radio make one-handed tuning as easy as possible. 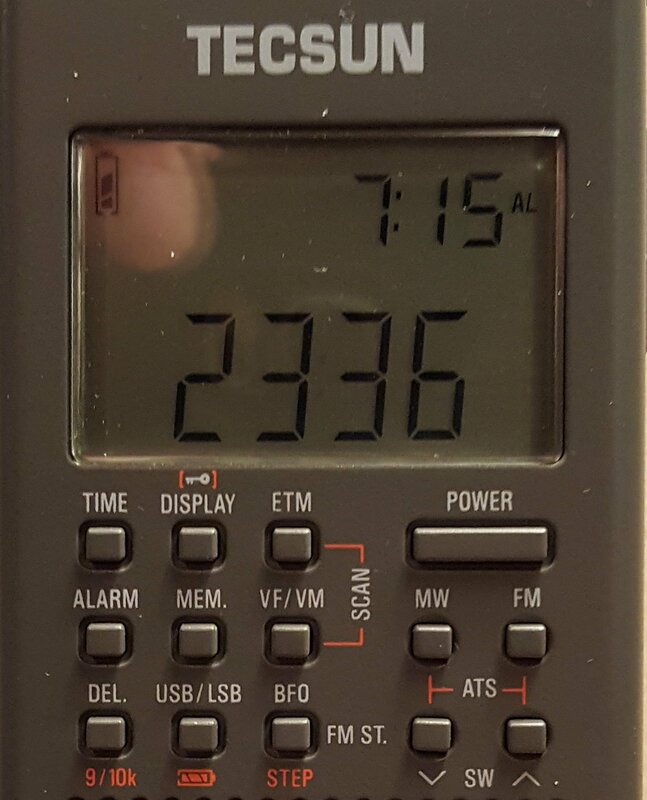 For many users that fact alone will make the PL-365/CountyComm GP-5/SSB well worth the price of admission…it is a unique product!